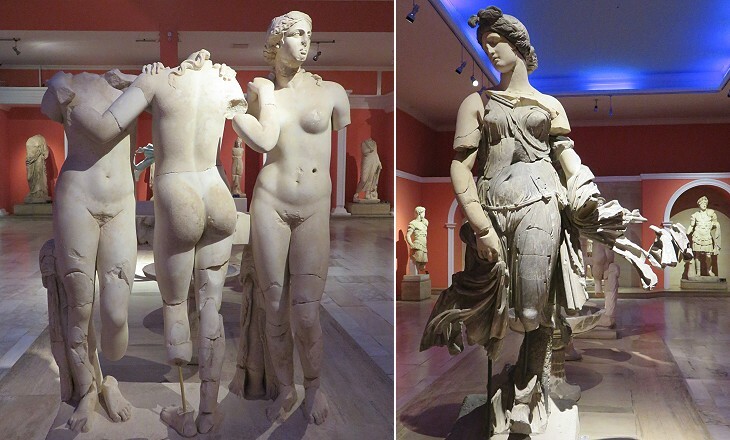 You may wish to see an introduction to this section or on Antalya and Perge first. 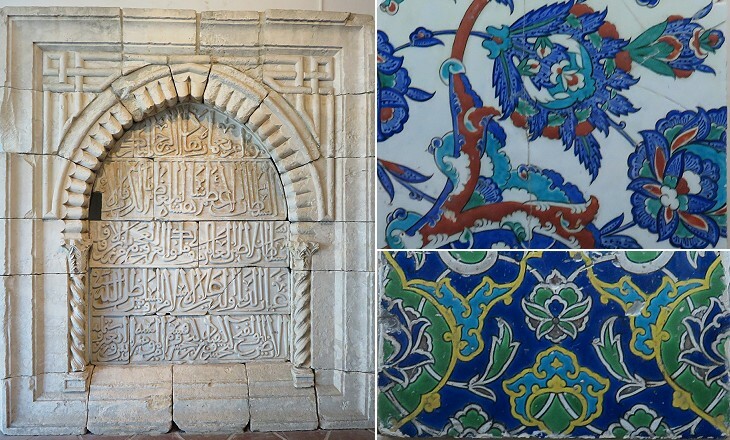 The Archaeological Museum of Antalya was founded in the 1920s and it was initially housed in Alaeddin Camii. The findings of archaeological excavations became so many that in 1972 the exhibits were moved to a specially designed building outside the walls of the town. 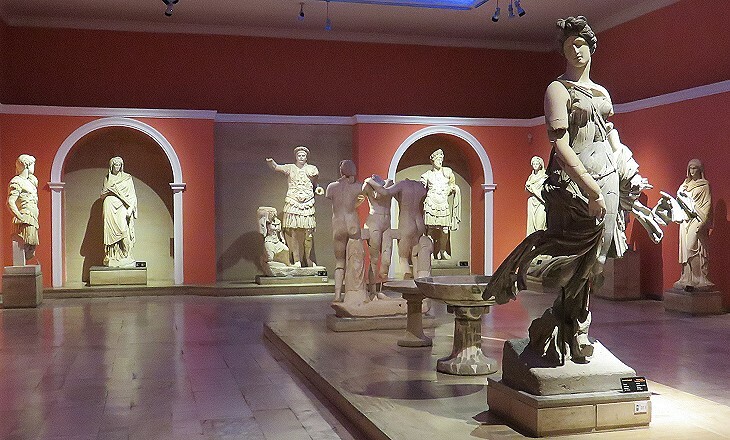 The Museum was recently redesigned in order to display in a somewhat spectacular manner some of its most impressive exhibits and in particular the statues which decorated the theatre, the city gate and other monuments of Perge. 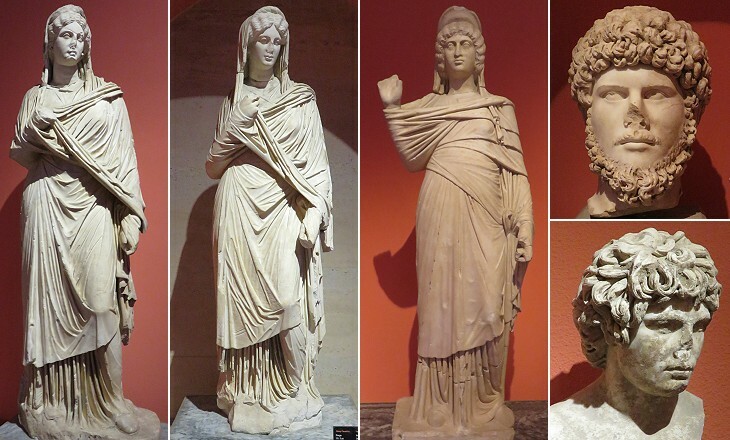 Most of the large statues of the emperors found at Perge were made at the initiative of Plancia Magna, a local wealthy woman whose father was of Roman origin. 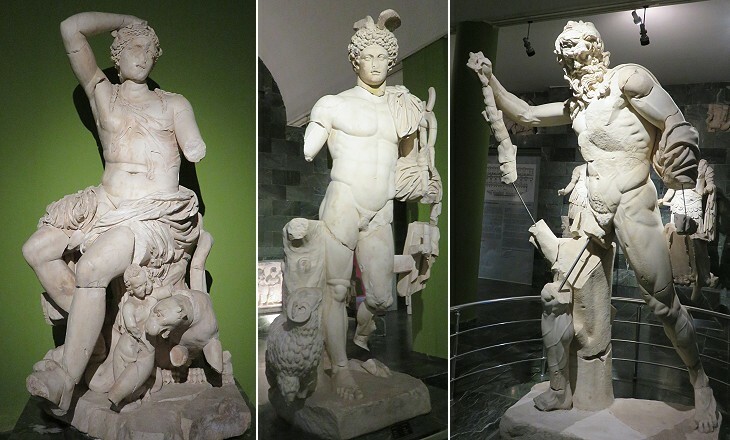 The statues are dated 120 AD based on inscriptions making reference to Plancia Magna. 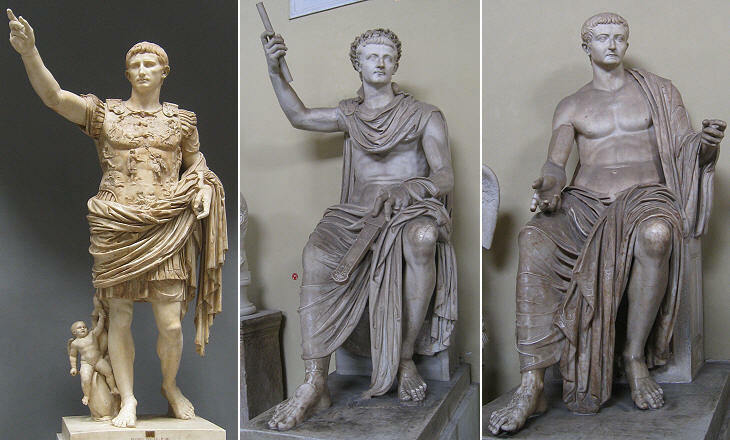 The emperors were portrayed wearing a civic crown, a wreath of oak leaves, one of the highest Roman military decorations (you may wish to see statues of earlier emperors in similar poses at the Vatican Museums in Rome - it opens in another window). 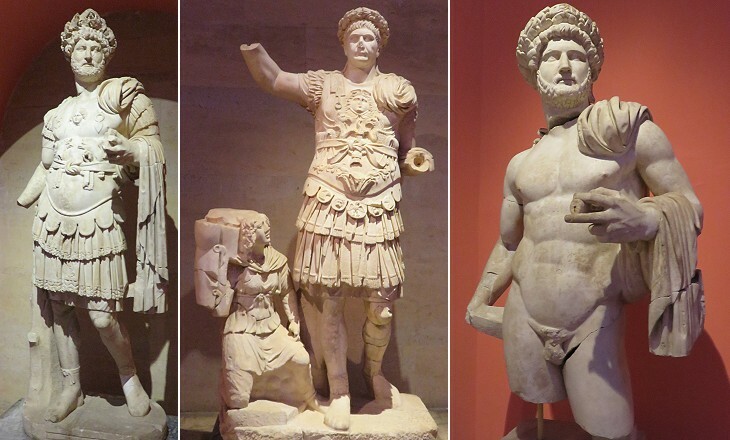 The municipality of Perge or other donors ensured the collection of statues was updated in a timely manner with those portraying the following emperors and their wives. A decline in workmanship is noticeable in the statue of Julia Domna. Some details had a meaning: the locks of Antinous were typical of slave youths. 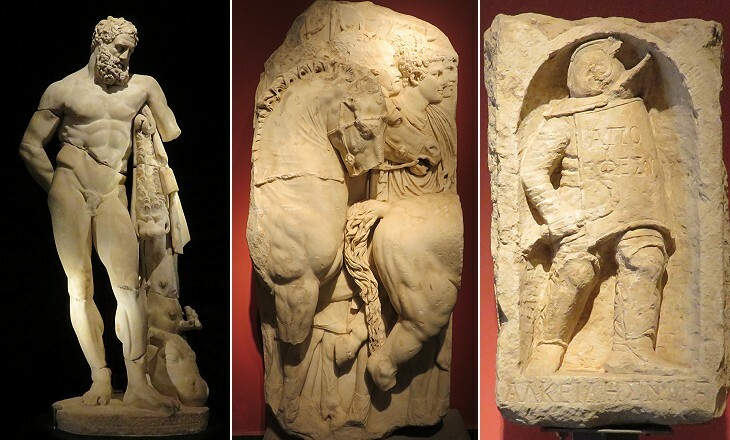 In recent years similar large statues of Roman emperors and their wives were found at Sagalassos, in the mountains north of Antalya. The statues of the emperors and their wives were made to be placed inside niches and were designed for a frontal view. Other statues were placed at the centre of halls and were therefore seen from all sides. The Three Graces were a subject especially appropriate to stand in such a position because one of them looks in a direction opposite to that of the other two. The Dancing Woman with her rotating movement and her draped cloth could be admired from different angles. It could be mistaken for a Baroque statue of the XVIIth century (e.g. 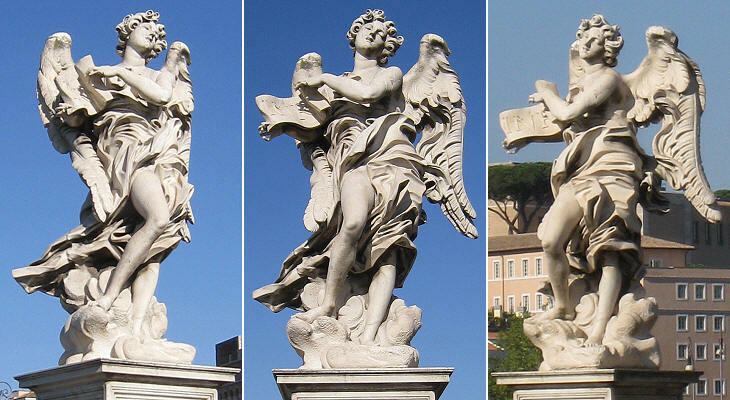 an angel by Gian Lorenzo Bernini - it opens in another window), all the more considering that black and white marbles were employed to obtain a colour effect. Born with the dawning, at mid-day he played on the lyre (..). As he stepped over the threshold of the high-roofed cave, he found a tortoise there and gained endless delight. For it was Hermes who first made the tortoise a singer. The creature fell in his way at the courtyard gate, where it was feeding on the rich grass before the dwelling, waddling along. (..) He took up the tortoise in both hands and went back into the house carrying his charming toy. Then he cut off its limbs and scooped out the marrow of the mountain-tortoise with a scoop of grey iron. (..) He cut stalks of reed to measure and fixed them, fastening their ends across the back and through the shell of the tortoise, and then stretched ox hide all over it by his skill. Also he put in the horns and fitted a cross-piece upon the two of them, and stretched seven strings of sheep-gut. But when he had made it he proved each string in turn with the key, as he held the lovely thing. At the touch of his hand it sounded marvellously. Translation by Hugh G. Evelyn-White. The Battle of the Giants, namely the battle of the sons of the Earth with the Olympian gods for power was depicted very frequently in ancient Greek art. Initially the Giants were portrayed as fully human, but eventually they had snake-legs. 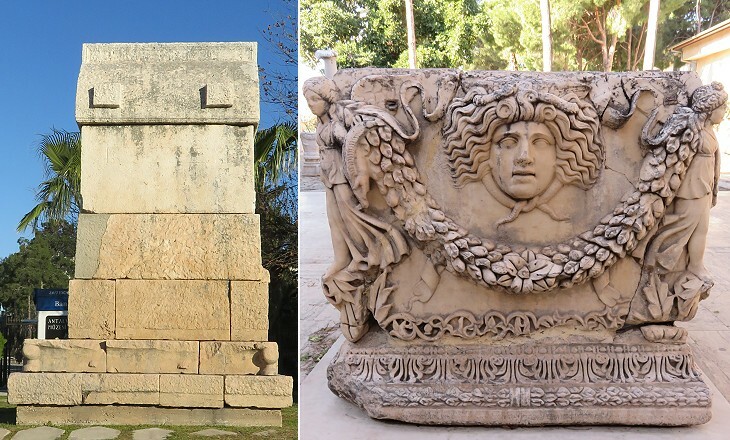 It is interesting to note that Cybele appears in the Gigantomachy found at Perge, although she was not one of the Olympian gods, but an Anatolian deity. Artemis is portrayed as patron of Perge in a long relief showing a sacrifice. At first sight the two old priests seem to have a halo, but they actually wear a crown. 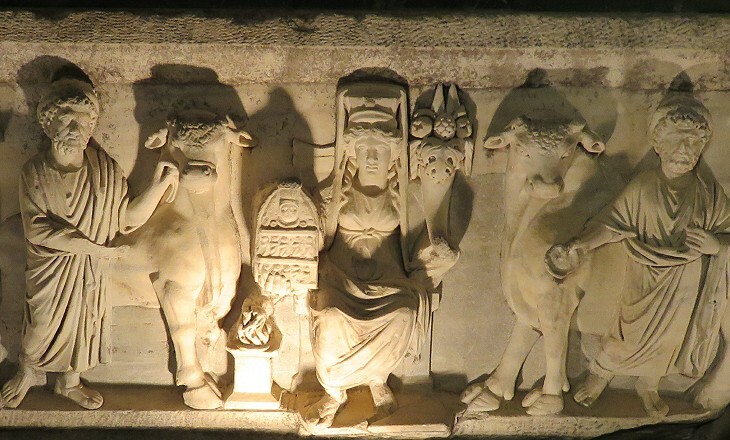 The relief depicts a moment of the yearly festival which, according to Strabo (60 BC - 24 AD), was held at the Temple of Artemis Pergaea. The temple was described by Polemon of Laodicea (90 - 144 AD), a master of rhetoric, as a marvel of size, beauty and workmanship, but it has not yet been found. Dionysus was the God of Theatre and obviously a statue portraying him drunken near his panther was placed in the theatre of Perge. A very fine statue of this god has been found at Sagalassos. Hermes, in addition to cruelly killing tortoises, was the God of Herds and thus he was portrayed next to a ram. 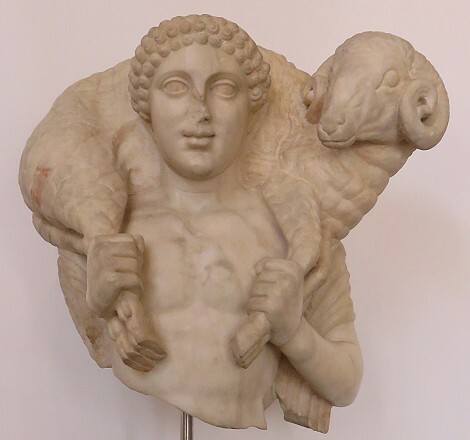 Hermes Kriophoros (ram-bearer), a particular type of statue of this god, is regarded as a forerunner of the Good Sheperd. You may wish to see a fine Hermes Kriophoros (it opens in another window) at Museo Barracco (Farnesina ai Baullari) in Rome. 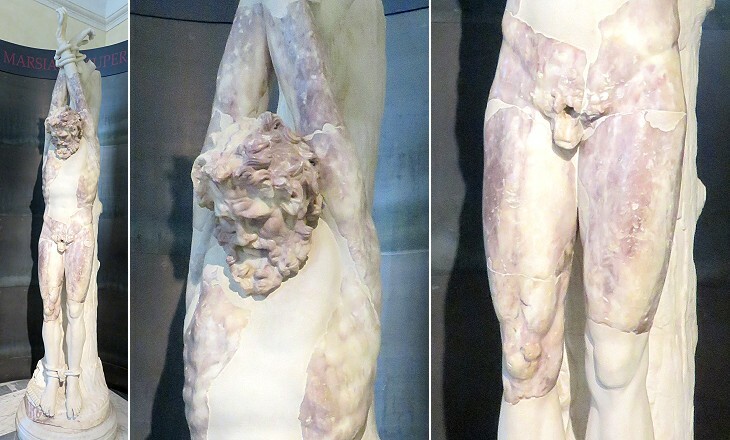 Usually Marsyas was portrayed while Apollo was flaying him alive, a most horrible image which some sculptors made even more gruesome by using a reddish stone (as in a statue - it opens in another window - found at Caracalla's Baths in Rome). 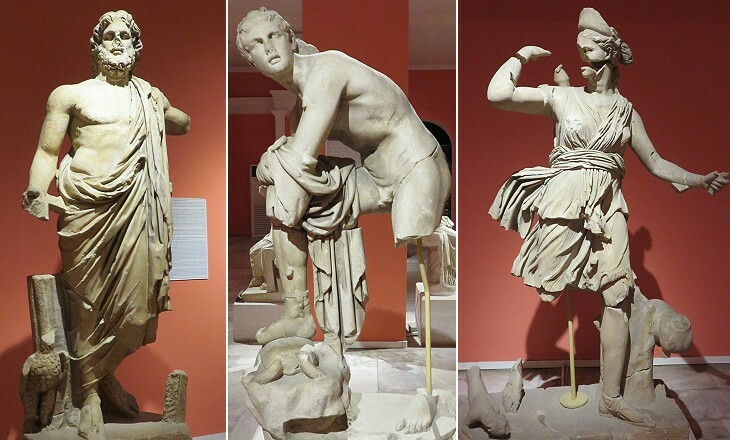 Marsyas however was a follower of Cybele and this might have influenced the way he was depicted at Perge. He holds his skin on his left hand and his veins, especially those of the legs, are very evident, but overall he looks angry and in good shape. The Museum houses in a dedicated hall an interesting collection of sarcophagi found at Perge. They are an indication of the wealth of the town. 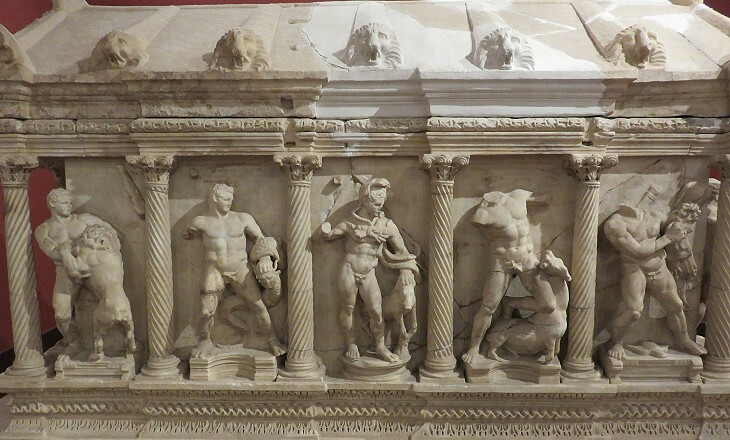 Two of them depict the Twelve Labours of Hercules/Heracles, a popular subject for friezes decorating the box of sarcophagi (or buildings as at Leptis Magna). 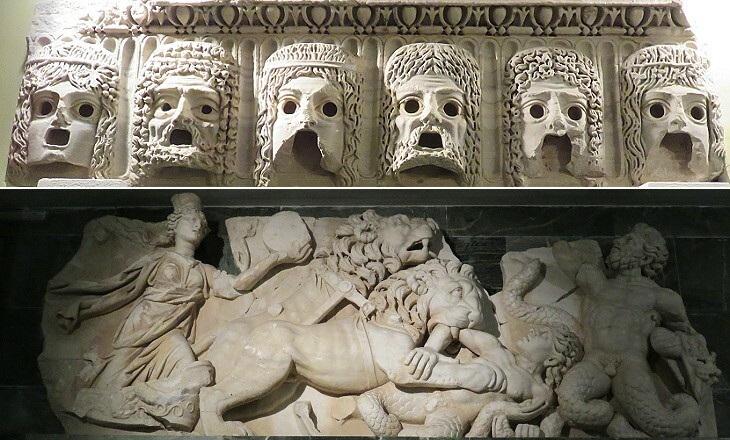 Usually five labours were depicted on the long sides and one labour on the short ones, but there are sarcophagi where each long side had six labours and the short sides were decorated with a door or a Head of Medusa (see two sarcophagi in Roman museums - it opens in another window). 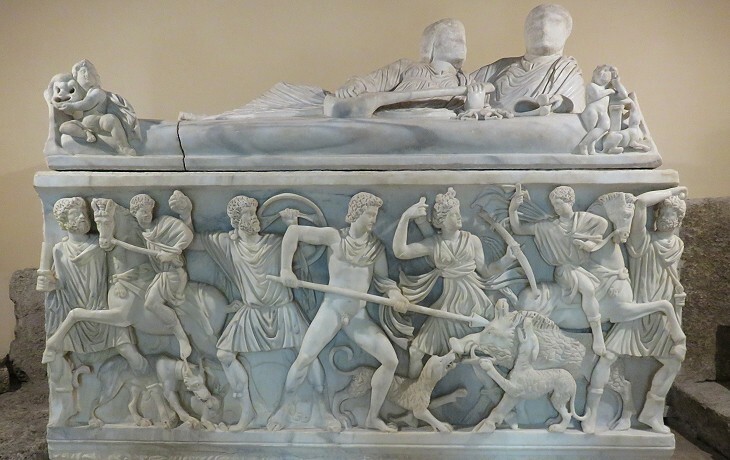 In some sarcophagi the depiction of the Twelve Labours (or of another event such as the Hunting of the Calydonian Boar - it opens in another window) coexisted with that of a temple or of a house. The lid had the aspect of a gable roof and lintels and columns linked it to the base of the box. This design is named after a sarcophagus found at Sidamara, near Konya. Some very expensive sarcophagi had a decorated lid where a couple was portrayed in the act of attending a (funerary) banquet. They were not made to order and they left the workshop with the faces of the dead still unfinished. 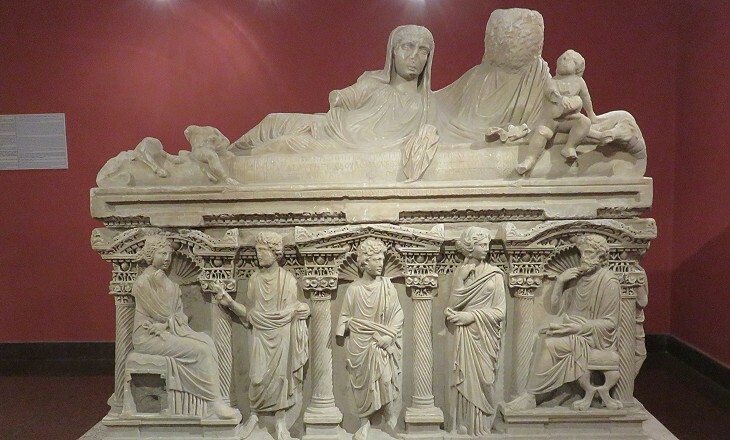 In this sarcophagus the buyer had the face of his wife properly sculptured, but his heirs did not spend their money to complete the work. 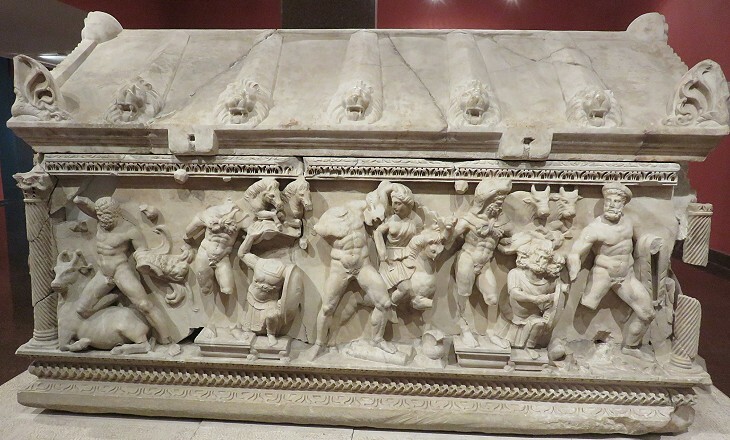 You may wish to see a page on this type of sarcophagi which includes another example from Perge. The halls and the garden of the Museum house a very large sample of statues and reliefs of the Ist and IInd centuries AD which show the high level of skill achieved by local sculptors. Unfortunately they were often asked by their customers to make copies of classical works (e.g. Heracles Resting aka Hercules Farnese, after a IVth century BC bronze statue by Lysippos), rather than being allowed to show their creativity. 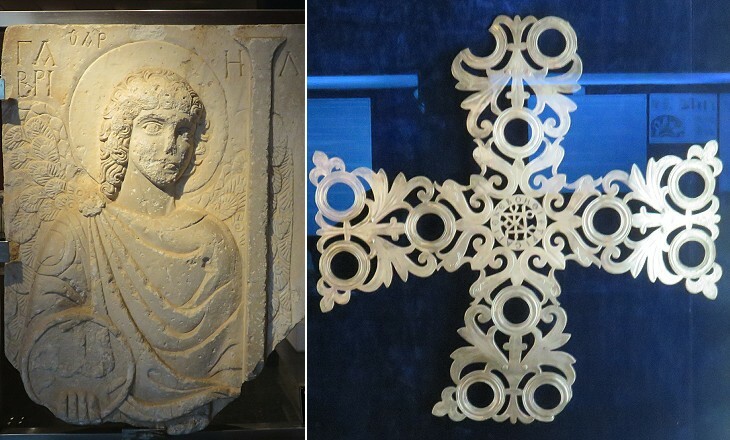 The Museum includes sections covering works of art related to the history of Antalya and its region after the IIIrd century AD. 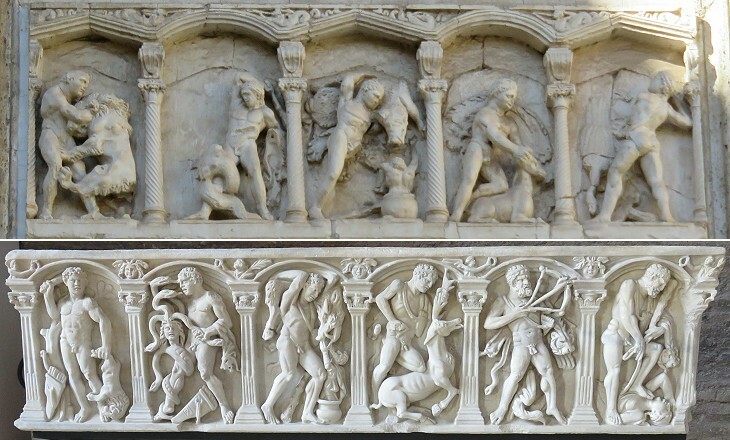 The image used as background for this page shows a detail of a relief in the garden of the Museum.